← How Is North Korea’s Juche Ideology Similar To Christianity? Visiting the homes of North Korean defectors is one of my favorite things to do while I’m in South Korea. When I was in Korea last May, I had a crash course in Christian visitation, visiting the homes of 8 North Koreans in just a few days. On my most recent trip, I was able to go back to one of the homes of the defectors I had spent time with last May. The last time I visited this defector’s home, there were only two of us who visited – myself and a translator. But on this particular visit, there were 8 people going over for dinner in addition to the husband and wife who lived there. I was immediately concerned because I remembered that their apartment was rather small. The only place for all ten people to gather was in their living room/bed room which was no bigger than most Western style master bathrooms. I wisely kept my mouth shut, but I wondered how they were going to fit everyone in their house and I wondered how I would enjoy feeling like a sardine in their small living room. When the evening came, we all filed into the apartment and although it was rather tight, we all found a place to sit in the living room. Because there wasn’t much furniture in their house, we all sat on the floor, and although it was a little uncomfortable we still had a good time. 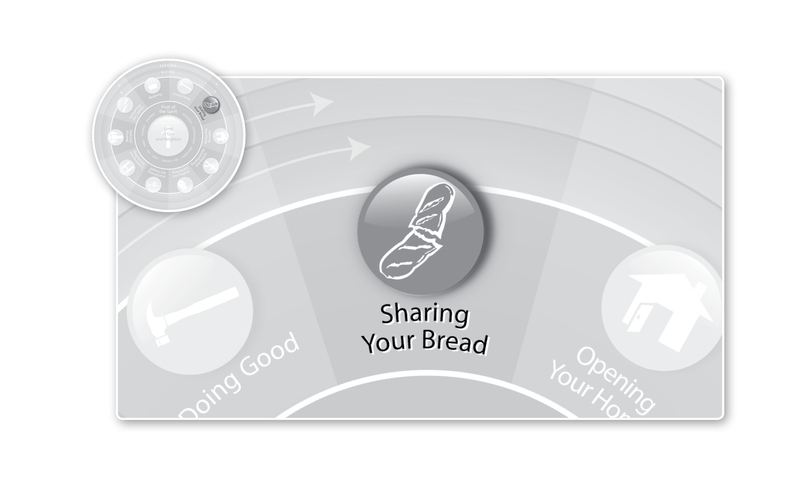 Before I even ate a bite of food that night, I learned something very valuable about the Works of Mercy of Sharing Your Bread and Opening Your Home. I learned that these Works of Mercy aren’t dependent (or even related to) the size of your home or the quality of your furniture and decorations. The Holy Spirit convicted me of this, because just a year earlier I had declined to host a Christmas party at my home because I didn’t think our family had enough space. Compared to the North Korean apartment that I ate in that night, our home was at least 5 times the size and of course we have a dinner table, a couch and some spare chairs if needed. I was reminded that Sharing Your Bread relates more to our food as a gift from God than it does the size of our home. It has more to do with understanding eating as worship than it does with the quality of the furniture, plates and silverware. Sharing your bread has more to do with the fellowship around the table than the size of the table itself. This entry was posted in Sharing Your Bread and tagged North Korean defector, Sharing Your Bread, South Korea. Bookmark the permalink. Thank you. I really love your blog thoughts about fellowship and hospitality. Thank you for reading Christy – God Bless! Good point Jody – this month really goes beyond just sharing food! We remembered this blog when strategizing dinner for 50. I borrowed the industrial size soup pot from church. And then added 50 sets of bowls, chopsticks and spoons to the list of supplies needed from the church’s kitchen. This included the church members as being a part of the set-up for the evening…and next time we will borrow tables, too. And next time we will enlist help with the set up…so maybe we are all hosting each other while saving my back from burdens it was never meant to carry….still working on communicating (both to myself and to others) that Jesus is always our host. Good job to get your local congregation involved in learning how to host! That’s what we call an O-move! Will you please communicate that O-move as a B-Boy dance?